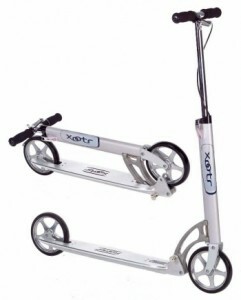 The Xootr Roma is the lightest, most compact Xootr kick scooter available, with a narrow deck for optimal kicking efficiency and ultra-low-resistance polyurethane tires for a super-efficient glide. As with all Xootr scooters, the Roma employs the patented steering and folding system for easy transport and storage. The new X4 model uses a QuickLatch, replacing the Ergo Locking Pin from prior models. Brake: Front brake with BMX-style brake lever. Additional rear brake available. Pick-up available in Toronto. Contact us at info@rainbowsongs.com for hours or to book an appointment.